A new, precise Extended Range Artillery (EXTRA) munitions system was developed by Israel Aircraft Industries' (IAI) MLM System Integration Division and Israel Military Industries (IMI) Rocket Systems Division and was publicly unveiled at the 2005 Paris Air Show. The EXTRA contains a solid propellant motor, stabilizing block, warhead, and GPS/INS guidance and steering section. EXTRA comes in a disposable sealed canister providing a long service life and very low maintenance costs. EXTRA munitions have a range in excess of 130 km (81 miles) and carry a125 kg (275 lbs) warhead. 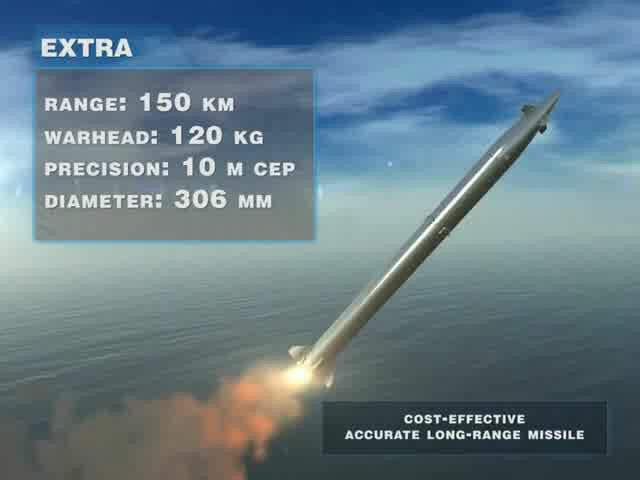 EXTRA's launch weight is about 450kg (990 lbs) and it is precise to within 10m. EXTRA munitions are 30cm (12 inches) in diameter and 3.97m (13 feet) in length, similar to the M270 Multiple Launch Rocket System (MLRS). Cluster launch tubes can be mounted on trucks or in highly mobile battlefield fixed. Capable of being launched from multiple platforms, the EXTRA is packaged in a four-unit pod configuration for land-based launches. It can be installed on a high mobility truck or in a fixed installation. EXTRA capable of launching from a variety of means to carry, launch tubes are assembled in clusters of 2 to 16 to launch from the ground. IAI and IMI invested equally in the development program and pooled their experience in rocket motors, warhead and guidance systems to develop EXTRA, building on developments in precision-guided non-line-of-sight strike technology. 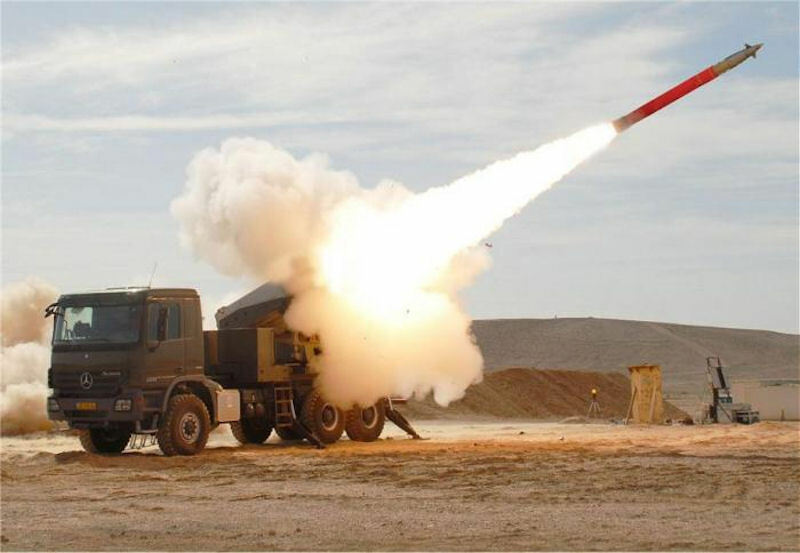 IAI gained valuable knowledge that it has applied to the EXTRA from the development of its Long-Range Artillery guided missile, which is designed for a greater range. The Extra circle error probable [CEP] is about 10 m. This is considered a very small error compared to American standards (200-300 m is considered as the average error is acceptable). The rocket features IAI’s GPS-based inertial navigation system with a gas generator thruster correcting the trajectory during flight. The target data is installed in the rocket while in the launcher and, once fired, the rocket autonomously navigates itself to a target. IAI said the EXTRA was in progressive stages of development in 2005 and its MLM division performed a series of tests and customer demonstrations in the second half of 2006. According to defense-studies website, IMI will sell twenty accurate EXTRA rockets to Vietnam. Along with its 4K51 Rubezh, Bal-E, Bastion-P and REDUT, the EXTRA system will help the Vietnamese Navy to form a network of integrated coastal defense. Mainly from China. 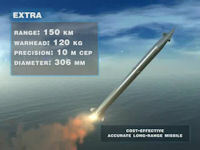 In the future, a new missile will be developed to extend the firing range from 150 to 300 km. In January 2018 Israel's Defense Minister Avigdor Lieberman instructed the military to establish a new force of ground-to-ground missiles with a range of up to 300 kilometers. On January 4 Lieberman met with senior IDF officers and decided to form the array, pledging a starting budget of some 500 million ILS (about $145 million). The project could cost up to 7 billion ILS ($2 billion), spread out over a decade, depending on the number of missiles the IDF will acquire. This planned missile corps is reportedly meant to act as the offensive counter to Hezbollah's vast arsenal of more than 100,000 short- and medium-range rockets, to complement the military’s existing defensive multi-layered air defense system. The country's new missile unit will include extended-range missiles like Extra, meant to replace air-ground weapons for mid- to long-range strikes, with a 150 km range. Israel had already been manufacturing Extra for foreign buyers; however, Israel's navy and air force are also expected to adopt them. After Israel attacked alleged Iranian targets in Syria May 9, continuing a series of strikes that began an hour after US President Donald Trump pulled out of the 2015 Iran nuclear agreement the day prior, Syria claimed that surface-to-surface missiles were used against their forces.